Back then they preserved food just to survive another day — not to plan for food storage 25 years down the road. 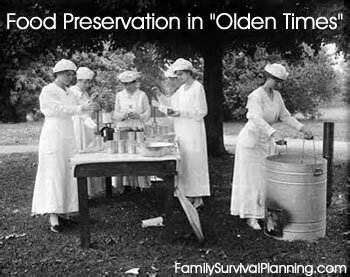 So why would we want to go back to the "olden days" of preserving our own food as opposed to just buying from a store? The satisfaction of knowing we can do it if we have to. Of course, safety in home food preservation is paramount. The goal of "preserving" food is to minimize or inhibit the activity of microorganisms, enzymes, and chemical reactions that can cause spoilage and illness. We can control the growth and activity of undesirable microorganisms, enzymes, and chemicals by using correct temperatures and preservation methods, and eliminating oxygen for storage. Dehydrating or drying food products is the oldest method of preserving food. The early American settlers dried foods such as corn, apple slices, currents, grapes, and meat. 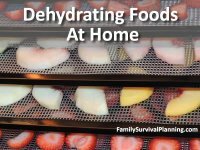 Dehydrating food is simpler than other methods. Because the moisture content is so low, dried foods are perfect for long term food storage. Low moisture inhibits the growth of those unwanted organisms and chemical reactions that can spoil food or make us sick. And the variety of food products that can be dried makes preparing meals from scratch easy. Just create your favorite soup and toss in some dehydrated green beans, corn, carrots, cabbage, several pieces of jerky and some pearl barley, and you have a hearty, nutritious meal. Then give each of the kids an apricot/mango fruit roll-up for dessert. What could be better? Do you have a big freezer? 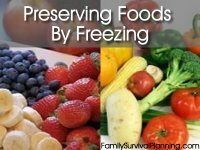 Freezing foods to 0°F is the easiest, most convenient, and least time-consuming method of preserving foods. Freezing does not destroy the organisms that cause spoilage or food borne illnesses; the extreme cold does however, inhibit their growth. Freezing also slows the activity of enzymes and chemical reactions that affect quality or cause spoilage. Refrigerating foods to below 40°F preserves foods by prolonging their shelf life. The cool temperatures slow the growth of most microorganisms and reduces the activity of enzymes and chemical reactions. While refrigeration slows the activities of microorganisms, enzymes, and chemicals, they are not inhibited. Left in the refrigerator long enough, food will eventually spoil. Refrigeration is a wonderful convenience for us but it is not for long term storage. Canning (also known as "jarring") preserves foods by heating them to high temperatures. The canning process boils out the oxygen and forms a vacuum in the can or bottle. 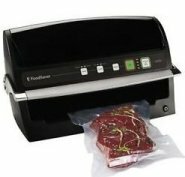 This method kills most food borne illness microorganisms except Clostridium botulism (botulism). Now don't panic! Botulism spores are on everything including the dirt that grows our food. When the conditions are just right, the spores will germinate, multiply, and die which then produces a deadly toxin. 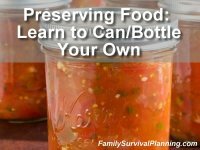 That's why it's important to use the proper canning methods for each food product. Fermentation is different than other methods of preserving foods. In the fermenting method, we want the "good" microorganisms to grow and produce byproducts. An excellent example is yogurt. A culture of desirable bacteria is added to milk which consumes the milk sugars and produces lactic acid. This lactic acid reduces the pH and the milk coagulates. adding a desired microbial culture - fermentation - that produces an organic acid. The organic acid must lower the food's pH to below 4.6. At this pH level many micro-organisms cannot grow and enzyme and chemical activity are reduced. Further heat processing (canning) destroys the remaining micro-organisms and enzymes of concern. Curing uses salt to reduce the water available to micro-organisms, enzymes, and chemicals reducing their activities. Meats, poultry, game, and seafood can all be cured. The addition of nitrites and salt inhibits Clostridium botulinum(botulism). Cured foods may or may not be smoked. Smoking meat is a choice for those who love the taste and smell of smoked meats and also preserves them. Smoking works by applying heat and chemicals, which causes surface dehydration. Heat from smoke cooking can kill micro-organisms, depending on time and temperatures used. By making foods into jam or jelly minimizes the spoilage from mold and yeast growth by adding sugar, which reduces the amount of available water, and cooking/canning to destroy undesirable bacteria. The preserving methods for jams and jellies are cooking, then canning, or freezing. Either of these methods will give you a better tasting jam/jelly than can be purchased in the store. Freezer jam tastes so much like fresh fruit - it IS my favorite. 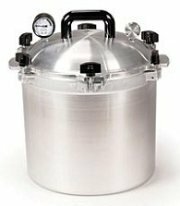 However, for long-term storage, the cooking/canning method is best.